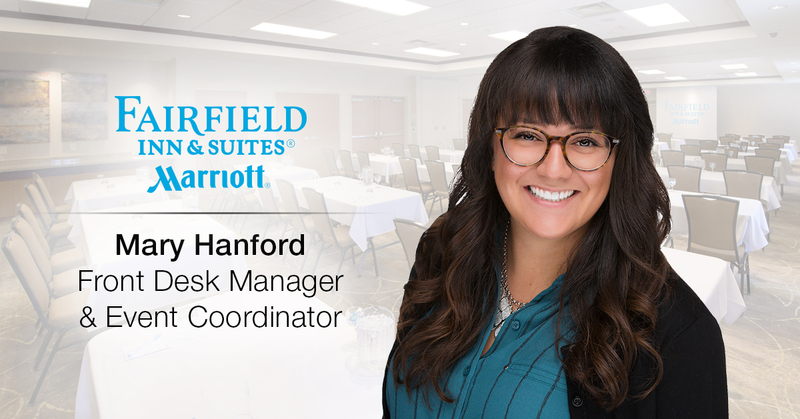 Ghidorzi Hotel Group is pleased to announce the promotion of Mary Hanford to Front Desk Manager and Event Coordinator of the Fairfield Inn & Suites by Marriott of Wausau, an 87-room property with 5,000 square feet of conference space. Mary’s true hospitality spirit and progressive leadership since joining the team in 2013 make her the ideal fit for this key management position. Mary has an Associate of Arts degree from the University of Texas in San Antonio and is pursuing a Bachelor’s in Business from University of Wisconsin-Extension. Outside of work, Mary enjoys spending time with her dogs, kayaking and motorcycle rides.